A traditional log home that has been lovingly restored and updated. It's one of three cabins on 8 private acres. Blue ribbon flyfishing along a pristine stretch of the Main Boulder River. It's a mountain retreat but you also get wireless Internet and an iPod dock! This home sits above the Mountainside Cabins. You can rent all three cabins to accommodate up to 18 guests. Brief Description A traditional log cabin, lovingly restored and updated in the beautiful Main Boulder Valley. Built in the 1940's by the owners parents, it was the show place of the valley where folks gathered for square dances, music and card games. It's a great retreat for anyone who wants to enjoy pure mountain air and some amazing fishing on the Main Boulder River just down the road. The sound of the creek out the back door will lull you to sleep at night. Bedrooms and baths An upstairs guest bedroom has a queen bed with a rustic handmade headboard in the east alcove and a view of the mountains. The west alcove looks out on the forest and has two twin beds. Both alcoves have ceiling fans with lights and a lantern-light lamp in the middle of the room. Built in drawers and shelves are part of the original design. A table and chairs against the wall offer seating for games or computing. Downstairs the master bedroom has an open beam ceiling and wood floors. The king bed has a shelf at the foot with a TV, BluRay DVD player, and lots of DVD's. A leather chair, lamp and end table face another native stone fireplace with a gas insert. Next to the closet is a door leading out to the deck. The master bedroom also has great mountain views. Next to the bedroom is a complete bath with a tub and shower. The hall past the dining room opens to a laundry room and half bath. Living Room From the screened front porch you enter the spacious living room with the original hardwood floor. It is divided into two seating areas with comfortable leather couches. One looks out a picture window at the beautiful Contact and Teepee Mountains. A round table sits adjacent to the window next to a cabinet filled with games and puzzles. On the other side of the seating area is another cabinet with a TV, BluRay DVD player and a large selection of DVD's. (No dish TV.) The other seating area is by the native stone wood burning fireplace. The fireplace is flanked by bookcases filled with old books and memorabilia. An antique honky-tonk piano sits in the corner. The long beams on the ceiling have lighted fans and scones on the wall are the original western glass. The room is accented with a collection of Navajo rugs and original art. 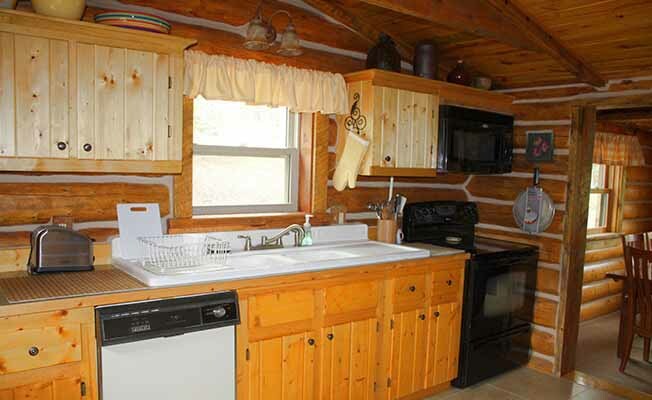 Kitchen & Dining: This kitchen has two windows that look out on the forest and is well equipped for your crew with a dishwasher, microwave, food processor, blender and crock pot; you are all set for your stay. The sink has the old corrugated porcelain drain board. There is a Keurig coffee maker with a selection of K cups and a Mr. Coffee brewer. The dining room just off the kitchen has a table, six chairs and a small wood stove. The view is of the creek with water tumbling over small falls. There is also a large gas barbecue grill located on the back deck. Setting, acreage, and views Tucked up in the Main Boulder River Valley, you have eight acres to explore and the property borders National Forest land which gives you thousands more acres for exploring. Views are of mountain slopes and the beautiful upper Boulder Valley. A short walk brings you to the Boulder River, a stretch with great fishing! It's also a great spot for children to play and to bring a picnic lunch. There is great hiking right out the door to Indian pictograph caves and to high peaks. You're a world away but there's so much to do! Outdoor Amenities A large front deck and a small back porch, a barbecue grill, hammock by the creek, a picnic table and plenty of other outdoor seating is available.